Big data is more than just a business tool. The intelligent use of enormous amounts of data to make more efficient decisions is also becoming a reality in cooperative, philanthropic and social environments. In fact, big data can help to build a better world. This is where the Sustainable Development Goals come in. Back in 2015, the international community agreed to achieve these 17 goals within a time frame of 15 years. Companies play an important role in this global effort. To channel their work, the Global Compact Network, of which BBVA is a part, was created. Joining it implies a commitment to ethical management, based on the Ten Principles of the UN Global Compact. The Sustainable Development Goals are an enormously complex challenge in all areas. To analyze the degree of compliance with them, big data is essential. That’s the obsession of Philipp Schönrock, director of Cepei (the Center for Strategic International Thinking), which aims to convert the 17 goals into something tangible, through 169 concrete objectives. The point of departure could be much better. According to Schrobröck, no country in the world has enough statistical information to measure its progress in achieving the objectives. “On average, the countries only have information on 39% of the indicators. That is, there’s still a gray zone of more than 60% of the information.” he says. This poses a great obstacle if you want to be accurate about the real impact of the policies being carried out. “We need information, so that we can measure it. And right now, we have the capacity required to do that,” said Schönrock during a talk at the sixth annual Big Data Week, held in Madrid. 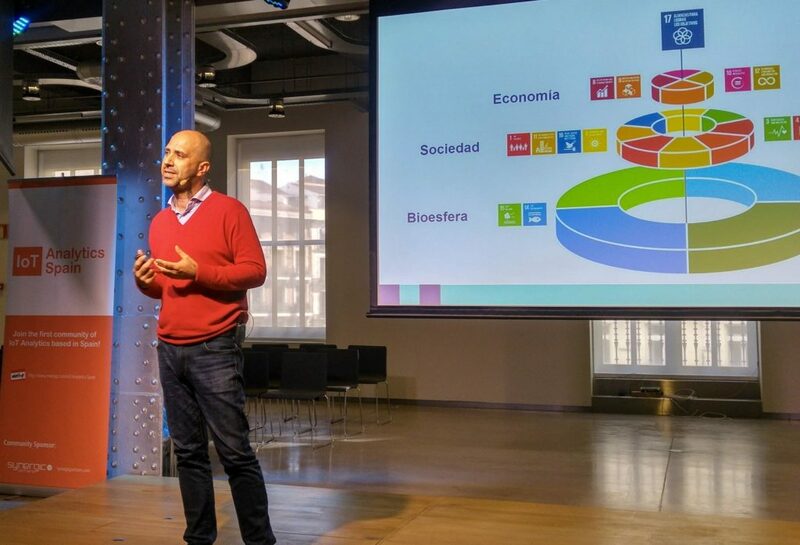 Philipp Schönrock, during his presentation at Big Data Week in Madrid. Given the challenge of access to information, this expert, who heads DataRepública, a data lab for sustainable development, advocates for the need to promote greater transparency. Companies and government agencies around the world have to collaborate more, by providing access to their data. To do so, it´s necessary to create trust among the different actors that share their data, to assure a responsible use of them. Obtaining this data with precision and speed is key to being able to measure the efficiency of the policies that are being carried out. Thanks to data, “you can see if the policies created to end poverty are benefitting the right people,” as well as what is going wrong and what can be improved. Schönrock is also concerned about the communication of data on development policies and on aid during humanitarian crises. “We have lots of good stories that are badly told,” he says. In his opinion, presenting information in the most attractive form will make it reach a wider public and have greater influence on public officials. There are already very interesting experiences in the use of big data in managing catastrophes. In 2016, UN Global Pulse and BBVA Data & Analytics developed a study on financial transactions before and after a natural disaster based on the real case of Hurricane Odile in the Mexican state of Baja California Sur. This study enabled the United Nations to validate the use of financial data to measure the resilience (the capacity for recovery) to natural disasters. “This type of quantitative data in real item about how people prepare for a catastrophe could be used to promote selective acquisition of supplies or money transfers to the most vulnerable segments of the population,” Miguel Luengo-Oroz, Chief Data Scientist at UN Global Pulse, said at the time. After these initial advances, the data narrative has begun to take on importance in the agenda of the experts. But when we talk about natural disasters, how does the data come from? How can we understand the human factor? Schöntock’s response is in visualizing data in a poetic fashion – he talks about “the poetics of data” – and telling stories with this narrative. To achieve this, Schönrock encourages data scientists to leave their comfort zone and work with data journalists and thus contribute to Sustainable Development Goal 17: establishing alliances to reach the goals. “It´s very interesting, because it´s the first time that we data scientists can enter other fields to communicate, analyze and investigate data in a very different way and create multi-sectorial or public-private partnerships,” Schönrock says.